Ready, set, and go! This Cars 3 Tech Touch Lightning McQueen Vehicle puts fans in the driver's seat and delivers three compelling ways to play. A thrilling new interface lets you and Lightning McQueen do signature moves from all iconic films. You can also design the race you want by drawing the route on the LCD touchscreen and watch McQueen go. This large-scale vehicle features iconic details, a colorful design, working lights, a mouth and eyes that move, and a vehicle body that reacts for true fan-to-champ interaction! 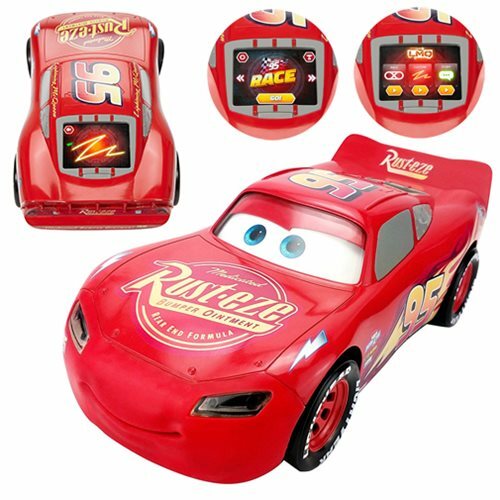 Get in gear with this Cars 3 Tech Touch Lightning McQueen Vehicle.